Pulmonary hemosiderosis (PH) is characterized by repeated episodes of intra-alveolar bleeding that lead to abnormal accumulation of iron as hemosiderin in alveolar macrophages and subsequent development of pulmonary fibrosis and severe anemia. See the image below. Image of a kidney viewed under a microscope. The brown areas contain hemosiderin. Pulmonary hemosiderosis can occur as a primary disease of the lungs or can be secondary to cardiovascular or systemic disease. In children, primary pulmonary hemosiderosis is more common than secondary types. Three variants of primary pulmonary hemosiderosis are recognized: (1) pulmonary hemosiderosis associated with antibody to the basement membrane of the lung and kidney (ie, Goodpasture syndrome), (2) pulmonary hemosiderosis associated with hypersensitivity to proteins in cow's milk (ie, Heiner syndrome), and (3) idiopathic pulmonary hemosiderosis (IPH). The diagnosis of isolated pulmonary hemosiderosis or idopathic pulmonary hemosiderosis is a diagnosis of exclusion, requiring thorough review and elimination of other causes of primary and secondary pulmonary hemosiderosis. In 1975, Thomas and Irwin divided pulmonary hemosiderosis into 3 categories: one category in which anti–glomerular basement membrane (anti-GBM) is present, a second category in which immune complexes are found, and a third category in which neither can be demonstrated. Following this classification, the pathophysiology of pulmonary hemosiderosis  can be divided into 3 groups. Group 1 pulmonary hemosiderosis is defined by pulmonary hemorrhage associated with circulating anti-GBM antibodies. This condition defines Goodpasture syndrome. 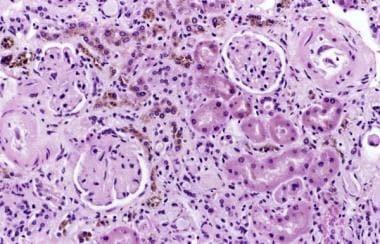 This syndrome is characterized by linear immunofluorescence deposition of immunoglobulin and complement along the basement membrane of the lung tissue and the kidney glomeruli and is associated with vascular damage and diffuse defragmentation of the basement membrane on electron microscopy. Group 2 pulmonary hemosiderosis is defined as pulmonary hemorrhage and immune complex disease. This combination has been reported as a rare manifestation of systemic lupus erythematosus (SLE) and other connective tissue disorders, including cryoglobulinemia, Henoch-Schönlein purpura, mixed connective tissue disease, and Wegener granulomatosis. Studies of patients with pulmonary hemosiderosis associated with hypersensitivity to cow's milk (ie, Heiner syndrome) have demonstrated circulating immune complexes; alveolar deposits of immunoglobulin G (IgG), immunoglobulin A (IgA), and C3; peripheral blood eosinophilia; and delayed hypersensitivity to proteins from cow's milk. Group 3 pulmonary hemosiderosis is defined as pulmonary hemorrhage without demonstrable immunologic association. This category includes idopathic pulmonary hemosiderosis, bleeding disorders, cardiovascular diseases, widespread infection, and toxic inhalation. Idiopathic pulmonary hemosiderosis is morphologically characterized by intra-alveolar hemorrhage and subsequent abnormal accumulation of iron in the form of hemosiderin inside pulmonary macrophages. Recurrent episodes of hemorrhage lead to thickening of the alveolar basement membrane and interstitial fibrosis. Transmission electron microscopy of lung biopsies has shown that the major damage in this disorder involves capillary endothelium and its basement membrane, but no electro-dense deposits have been identified. In the early 1990s, the incidence of acute idiopathic pulmonary hemosiderosis in young infants increased in several midwestern US cities, especially in the Cleveland area. Epidemiological research led to the discovery of heavy growth of the toxigenic fungus Stachybotrys atra in almost all of the case homes, suggesting that exposure to that mold can cause idiopathic pulmonary hemosiderosis in infants. Subsequent data question this association. Idiopathic pulmonary hemosiderosis is an uncommon yet well-recognized disorder. Exact figures regarding prevalence are lacking. Familial recurrence has been reported but is rare. Idiopathic pulmonary hemosiderosis is a rare disorder, with a reported yearly incidence of 0.24 (Sweden) and 1.23 (Japan) cases per million children. No national database monitors children with pulmonary hemosiderosis. Patients with idiopathic pulmonary hemosiderosis have a mean survival rate of 2.5-5 years after diagnosis. Death can occur acutely from massive hemorrhage or after progressive pulmonary insufficiency and right heart failure. In patients younger than 10 years, reports of idiopathic pulmonary hemosiderosis show equal distribution between males and females in the United States, Sweden, and Greece; however, in Japan the female-to-male ratio was 2.25:1. In patients older than 10 years, the male-to-female ratio is 2:1. Idiopathic pulmonary hemosiderosis may occur in people of any age, from the neonatal period to late adulthood, but it is most common in children aged 1-7 years. Goodpasture syndrome usually occurs in young adult males and is rare in infants. Heiner syndrome is usually diagnosed in children aged 6 months to 2 years. Gordon IO, Cipriani N, Arif Q, Mackinnon AC, Husain AN. Update in nonneoplastic lung diseases. Arch Pathol Lab Med. 2009 Jul. 133(7):1096-105. [Medline]. de Jongh AD, van Beers EJ, de Vooght KMK, Schutgens REG. Screening for hemosiderosis in patients receiving multiple red blood cell transfusions. Eur J Haematol. 2017 May. 98 (5):478-484. [Medline]. Sethi GR, Singhal KK, Puri AS, Mantan M. Benefit of gluten-free diet in idiopathic pulmonary hemosiderosis in association with celiac disease. Pediatr Pulmonol. 2010 Oct 21. [Medline]. Kahraman H, Köksal N, Ozkan F. Eight Years Follow-up of a Case with Idiopathic Pulmonary Hemosiderosis After Corticosteroid Therapy. N Am J Med Sci. 2012 Jan. 4(1):49-51. [Medline]. [Full Text]. Bhatia S, Tullu MS, Vaideeswar P, Lahiri KR. Idiopathic pulmonary hemosiderosis: alveoli are an answer to anemia. J Postgrad Med. 2011 Jan-Mar. 57(1):57-60. [Medline]. [Guideline] American College of Allergy, Asthma, & Immunology. Food allergy: a practice parameter. Ann Allergy Asthma Immunol. 2006 Mar. 96(3 Suppl 2):S1-68. [Medline]. [Full Text]. Shaked O, Gonzalez A, Bahirwani R, Furth E, Siegelman E, Shaked A, et al. Donor hemosiderosis does not affect liver function and regeneration in the setting of living donor liver transplantation. Am J Transplant. 2014 Jan. 14(1):216-20. [Medline]. Akyar S, Ozbek SS. Computed tomography findings in idiopathic pulmonary hemosiderosis. Respiration. 1993. 60(1):63-4. [Medline]. CDC. Investigation of acute idiopathic pulmonary hemorrhage among infants - Massachusetts, December 2002-June 2003. MMWR Morb Mortal Wkly Rep. 2004 Sep 10. 53(35):817-20. [Medline]. Dearborn DG. Pulmonary hemorrhage in infants and children. Curr Opin Pediatr. 1997 Jun. 9(3):219-24. [Medline]. Hoca, Nevin Taci. Dayioglu, Didem. Ogretensoy, Mihriban. Pulmonary hemosiderosis in association with celia disease. Lung. Sep-Oct 2006. 184(5):297-300. [Medline]. Ioachimescu OC, Sieber S, Kotch A. Idiopathic pulmonary haemosiderosis revisited. Eur Respir J. 2004 Jul. 24(1):162-70. [Medline]. Katz SM, Foster E, Miller AS, Krevolin L, Schwartz AB. Goodpasture's syndrome mimicking idiopathic pulmonary hemosiderosis. Ann Clin Lab Sci. 1989 Jul-Aug. 19(4):280-6. [Medline]. Kayser K, Plodziszewska M, Waitr E, et al. Diffuse pulmonary hemosiderosis after exposure to pesticides. A case report. Respiration. 1998. 65(3):214-8. [Medline]. Kiper N, Gocmen A, Ozcelik U, et al. Long-term clinical course of patients with idiopathic pulmonary hemosiderosis (1979-1994): prolonged survival with low-dose corticosteroid therapy. Pediatr Pulmonol. 1999 Mar. 27(3):180-4. [Medline]. Le Clainche L, Le Bourgeois M, Fauroux B, et al. Long-term outcome of idiopathic pulmonary hemosiderosis in children. Medicine (Baltimore). 2000 Sep. 79(5):318-26. [Medline]. Malhotra P, Aggarwal R, Aggarwal AN, et al. Coeliac disease as a cause of unusually severe anaemia in a young man with idiopathic pulmonary haemosiderosis. Respir Med. 2005 Apr. 99(4):451-3. [Medline]. McCoy KS. Hemosiderosis. Taussig LM, Landau LI, eds. Pediatric Respiratory Medicine. St. Louis, Mo: Mosby; 1999. 835-40. Milman N, Pedersen FM. Idiopathic pulmonary haemosiderosis. Epidemiology, pathogenic aspects and diagnosis. Respir Med. 1998 Jul. 92(7):902-7. [Medline]. Pinto LA, Oliveira A, Collaziol S, et al. Postinfectious bronchiolitis obliterans accompanied by pulmonary hemosiderosis in childhood. J Bras Pneumol. 2006 Nov-Dec. 32(6):587-91. [Medline]. Rossi GA, Balzano E, Battistini E, et al. Long-term prednisone and azathioprine treatment of a patient with idiopathic pulmonary hemosiderosis. Pediatr Pulmonol. 1992 Jul. 13(3):176-80. [Medline]. Saeed MM, Woo MS, MacLaughlin EF, et al. Prognosis in pediatric idiopathic pulmonary hemosiderosis. Chest. 1999 Sep. 116(3):721-5. [Medline]. [Full Text]. Sun LC, Tseng YR, Huang SC, et al. Extracorporeal membrane oxygenation to rescue profound pulmonary hemorrhage due to idiopathic pulmonary hemosiderosis in a child. Pediatr Pulmonol. 2006 Sep. 41(9):900-3. [Medline]. Torres MJ, Giron MD, Corzo JL, et al. Release of inflammatory mediators after cow's milk intake in a newborn with idiopathic pulmonary hemosiderosis. J Allergy Clin Immunol. 1996 Dec. 98(6 Pt 1):1120-3. [Medline]. Zaki M, al Saleh Q, al Mutari G. Effectiveness of chloroquine therapy in idiopathic pulmonary hemosiderosis. Pediatr Pulmonol. 1995 Aug. 20(2):125-6. [Medline].